The CAO OSA Sol marks the first new blend released under the CAO brand since it was integrated under the General Cigars portfolio last year. When I previewed the CAO OSA Sol, I was on the record saying I think the brand is in good hands. Late last year, it was announced that Team La Gloria’s Rick Rodriguez was joining the CAO team. Since then, CAO has added Ed McKenna as the Senior Brand Manager. From my conversations with Rick and Ed, it was clear the strategy was to preserve the legacy of the CAO brand and continue the high level of innovation CAO fans have become accustomed to. While from a strategic perspective, I am positive with the transition and leadership of CAO, ultimately things are going to come down to the final product. On the surface, the CAO OSA Sol showcases a lot of the unique things CAO has historically brought to the table, ultimately I found that this was a cigar that just didn’t fit my flavor profile. I’ve opted to give my first impressions using a Pre-Review. This is in order to give some first impressions of the cigar and describe some of my experiences with it. Given this was a pre-release IPCPR sample, I will set that as a parameter and add that things can change once the cigar hits retailer shelves. While I stated above this cigar did not favor my flavor profile, this does not make it a bad cigar – just perhaps not a cigar for me. In my 2011 IPCPR Series, I’ve discussed the resurgence of Honduran tobacco. The OSA Sol is one of those cigars that reflects this trend. The OSA name is an acronym for Olancho San Augustin – a region in Honduras. I admit this is a region I was not familiar with prior to hearing about this cigar. The wrapper is from a 2008 batch of the tobacco. The packaging also continues the innovative traditions of CAO – showcasing the Olancho San Augustin region of Honduras. The CAO OSA Sol is available in three sizes. The cigar will be sold in boxes of 25. For this cigar experience, I sampled the Lot 50 robusto-sized vitola. I placed a straight cut into the cap of the OSA Sol and commenced with a pre-light draw. The pre-light draw provided some notes of bittersweet cocoa powder. While I liked the flavor of the pre-light draw, I would have preferred more depth to the cocoa powder flavor. It was now on to fire up the OSA Sol and see what it would bring to the table. 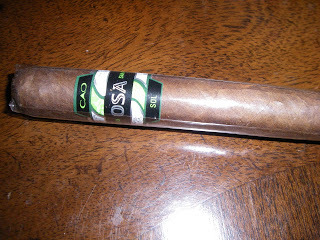 One general theme with the CAO OSA Sol that I was surprised about was the amount of spice that this cigar produced. This surprised me because the dry draw on the pre-light didn’t give me any indication of this. The spice started out with a cedar spice and quickly progressed to more of a cayenne pepper. If you have read many of my other assessments of cigars, you will know that I do like spicy cigars. However, spice must be balanced by complementary flavors. This is where I feel the OSA Sol fell short in my book. About 10 percent into the cigar experience, the cayenne spice subsided and the cigar took on more of a profile of grass. A pattern quickly developed where I would grass notes on the draw, and spice on the after-draw The spice was pretty pronounced. At this point, the spice started to take on more of a classic red pepper feel. In the second third of the cigar, I detected some of the cocoa notes I had on the pre-light draw along with tea flavors. The pattern of the red pepper spice on the after-draw continued during this point of the smoking experience. While there are times I don’t mind tea notes, I just felt in this case I would have rather had seen the cocoa notes develop more. On the last third, I noticed some citrus notes enter the equation join the tea and red pepper notes. The citrus notes actually push the spice toward the background. While I’ve had positive experiences with citrus notes, I felt these notes lacked any sweet flavors that would normally add to the flavor profile. The cigar didn’t finish harsh – and the nub was warm, yet firm. While the flavor profile just never did it for me, when it came to the construction attributes, I have very positive things to say about the OSA Sol. The burn was excellent and required very few touch-ups. It burned at a perfect rate and ideal temperature for a smoke. There was a little resistance on the draw at the midway point of the smoke, but overall an excellent draw. The CAO OSA Sol was advertised as a medium strength cigar and from my experience with the OSA Sol, I can confirm that this is indeed the case. While the flavor notes did not “wow” me, there was depth to the notes from a body standpoint. I definitely categorize the OSA Sol as a medium to full. The previous two cigar releases from CAO, the La Traviata and La Traviata Maduro were Cigar of the Year contenders in 2009 and 2010 respectively. The bar was going to be set high in 2011 for CAO. While I didn’t care for the flavors of the CAO OSA Sol, this is a not a bad cigar – and it might appeal to certain flavor pallets. I don’t think is a reflection of the new regime as sometimes the taste profile doesn’t agree with the individual. It’s quite possible this cigar may grow on me and I certainly am going to give it another smoke. Source: This samples were received at the 2011 IPCPR Trade Show. These samples were initiated by CAO in order to provide feedback. I am appreciative for the sample, but in no way does this influence this review.